Last week I went to Toronto to move some items into our newly purchased condo. I was also there to choose new colours for the entire space. I was particularly excited to explore colour options because I had taken Maria Killam's True Colour Expert training course in early June. I love colour, always have, but I realized that I was weak when it came to choosing colours for difficult spaces...spaces where as Maria would say the "bossy" and perhaps existing fireplace, floor, counter, backsplash or wood trim is preventing wise colour choices from being made. The key to choosing colours correctly in this case is to examine the undertones. Determining undertones in colours, especially in existing 'can't change them' colours, is essential in order to wisely decide on new colours that should enhance, not fight with the space. 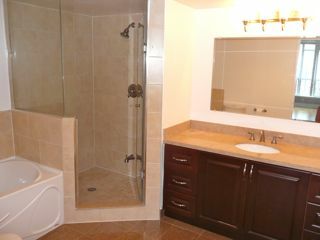 Both of the condo bathrooms exhibit pinky beige undertones in the floor and shower tiles and the counters. I realized, with my newly acquired knowledge of colour and undertones that I would find the perfect colour to complement the existing and permanent pinky beige in the two bathrooms. 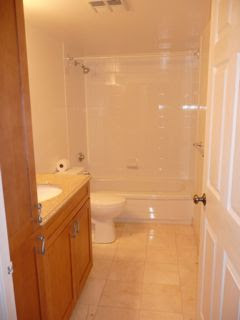 Armed with my new 50 large Benjamin Moore neutral colour samples that I ordered from Maria, I was able to quickly determine, through the process of elimination and comparison that Bradstreet Beige HC-48 was THE perfect colour choice for each bathroom. Maria, I'm certain would agree. The painters will be finished painting this week and I will be going back next week to try and complete the set up, or at the very least make it habitable for the family members who will be living there. Stay tuned for the continuing saga of how I chose the remainder of the colours, and how I managed to decorate the condo on a budget.